Four Acres, opened in October 2018, is a brand new, luxury residential care home situated in the village of Studley, close to Redditch and Worcester. Four Acres consists of 66 beautifully furnished and decorated, private en-suite bedrooms and superb shared spaces for residents to really thrive in. Four Acres has been recently reconstructed; benefiting from a thoughtful redesign and completed to the highest specification. Four Acres care home in Studley has been specially developed and modernised, creating a spacious and homely assisted living facility perfectly suited to accommodate seniors seeking an exclusive residential offering - a top Warwickshire care home, formally owned by Warwickshire County Council. The exceptional facilities available at Four Acres care home will enable residents to indulge in a truly fulfilling lifestyle in impressive surroundings, where health and wellbeing are a priority. Four Acres' Home Manger, Abdul Chirwa, provides an 'Outstanding' service for his residents, as rated by the CQC (Care Quality Commission) in his previous home manager role within the Runwood Homes group. Residents of Four Acres residential care setting in Studley, Warwickshire, can be assured to find an exemplary care home experience, offering a truly professional service where person-centred care and attention to detail are an every day importance. 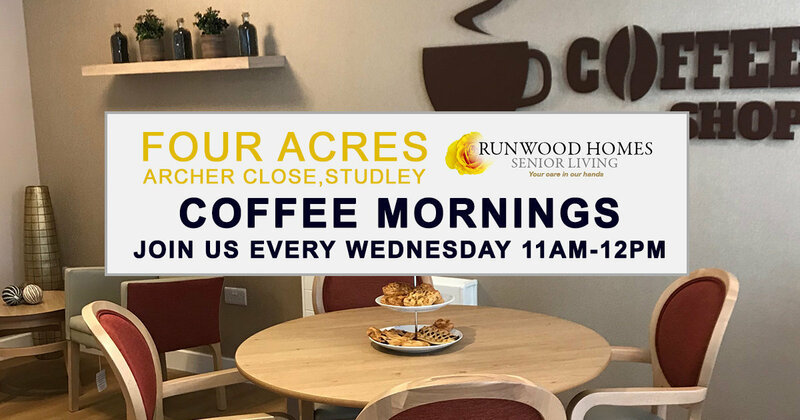 Our experienced team of professional, highly-trained Runwood Homes carers, who have transferred back to Four Acres following the homes' reconstruction, will be on hand to cater for each and every resident; providing unparalleled support and companionship on a 24-hour basis. This contemporary senior living offering close to Redditch, Stratford-upon-Avon and Worcester, is available to those who are searching for the most satisfying private residential care option in Warwickshire. Four Acres is closely connected with Warwickshire County Council to be able to offer some local authority placements or NHS referrals. We have fantastic relationships and partnerships with local Warwickshire healthcare providers including GP surgeries, hospital discharge teams and social care workers to ensure the smooth assessment and seamless admission of residents to Four Acres. Four Acres has a friendly and committed professional care team to cater for the needs of every individual resident - we are on hand for you. With over 30 years of experience, Runwood Homes are committed to delivering quality, person-centred care. Four Acres offers residential care, dementia residential care as well as respite care or short stay care. Health, wellbeing and ensuring dignity for everyone, everyday, is at the forefront of our care mission. Runwood Homes Senior Living encourages a stimulating and engaging lifestyle. Four Acres residents can benefit from a programme of varied activities, organised by a dedicated Activities Coordinator and supported by our Dementia Care Services team. Activities are planned with residents’ abilities, interests and past times in mind. At Four Acres we fully understand that choosing a care home can be a first experience for many. We are here to support you in your search for a suitable home offering the appropriate levels of care required. Please visit us to meet our professional care team, take a tour of our home and chat with our residents. You may Skype the team for a video viewing of Four Acres. The connecting email address to use, for Skype only, is fouracres-video@hotmail.com. For all enquiries, tour requests and consultations or assessments, please contact Four Acres, Home Manager, Abdul Chirwa on manager.fouracres@runwoodhomes.co.uk or call 07734 044596. Parking is available to the front and rear of Four Acres. We really look forward to welcoming you soon at Four Acres and are here to answer any questions you may have. Four Acres Senior Living Grand Open Day on Friday 8 March - Please join us! "Staff are truly wonderful; very caring and always on hand if and when you need them." "Dad has been treated with the highest degree of care and dignity I could wish for."